Last year, I attended a worship conference at a nearby church (not my home church). Friday night, one group of singers and musicians played, and a second band played Saturday morning. Both bands were mainly guitar-driven. Both bands had about the same number of musicians and singers. Both bands were on the stage in an attempt to lead worship. However, there were stark differences between the two bands. Band #1 sang through its first song, with little results. It was dry as a bone. I tried to worship with them, but it took a superhuman effort to focus on the Lord instead of on the dryness of the band. When they finally stopped playing that first song, the worship leader flipped through the notebook in front of him absently. There was a smattering of applause from the audience, which caused the worship leader to look up from his notebook. Then he said: “Yeah, why don’t you give the Lord some praise.” That suggestion seemed to be an afterthought. Then he found the song he was looking for. The band repeated the first-song-scenario with several more songs, all of which were dry as a bone… even though they were cover songs from churches that are known for their anointing! On these songs, however, there was no anointing, no impartation, no glory cloud. On Saturday morning, Band #2 was a different story altogether. When Band #2 kicked in, the glory of God sat down. The singers and musicians on the stage were worshipping, and you could tell. Not only that, they had come in prayed-up and worshipped-up. As Band #2 sang and played, we were brought into a radical encounter with Jesus. Band #2 sang about going up higher into the third Heaven where God the Father sits on the throne, and we felt like we were transported into the throne room of God. These people were not performing. They were not doing a job or putting on a show. Each singer and musician was caught up in his or her own encounter with Jesus, and you could come along if you liked. Of course, when someone is worshipping like that, you’d have to try hard NOT to come along. What made the difference between the two sets of worship leaders? Band #2 had something to impart. That’s it. The singers and musicians in Band #2 each had come to worship having already had their own encounter with Jesus. They were worshipping out of that encounter. They had come in prepped and ready. They were prayed-up and worshipped-up. Band #2 was worshipping out of intimate knowledge of the Lord and His Word. As they worshipped, they imparted their own encounter with the Lord to every person in the room. The entire congregation also entered into encounter with God because the worship leaders had already been there. Have you been with the Lord? Have you feasted on His Word? Have you had a radical encounter with Jesus Christ TODAY that makes you bow to the ground, weep, and cry “Holy!”? When you sing and play, are you testifying the story of your own life through the words to the song? If the answer is no, then you have nothing to impart. It doesn’t matter how skillful you are at playing your instrument. It doesn’t matter how smooth your voice is, or how high or low you can sing. 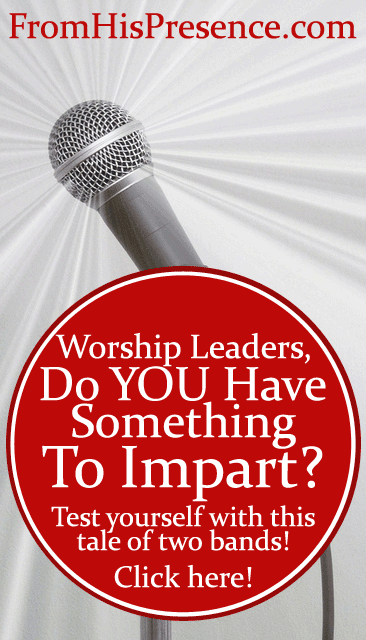 Leading worship is about impartation. In order to lead effectively, you must be able to enter into the third Heaven in worship yourself. If you will do that, everyone else will follow after you. But if you have no radical encounter with Jesus Himself to impart, then you’re wasting your time. Leading worship with nothing to impart is only a performance. Image courtesy of Melissa Baldwin on Flickr via Creative Commons license.